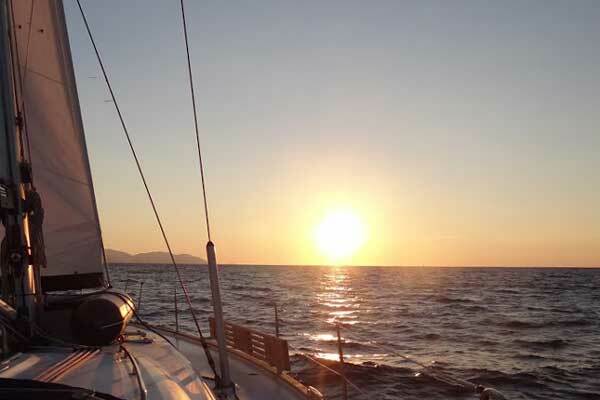 During this Flotilla Sailing Holidays in Greece we sail to visit the home of Odysseus: Ithaka. This sailing region of central Ionian Sea is rich in islands, mountains and bays. These hide the bluest water that we ever seen. We expect to eat well, drink good wine and satisfy our wanderlust for a little adventure. The route is designed to show the best that this region has to offer: lonesome bays, little villages, towering cliffs and a few gems that we want to keep secret. Just like Odysseus we will sail and explore what is beyond the horizon. Note: We are faithful to the true sailing spirit, therefore we plan exact stopovers together with the wind and the weather. Our trips are not a planned itinerary which is always the same. This means that the exact order of stopovers may be different to the one presented below, but definitely as much interesting! Our starting point for sailing in Greece is Lefkas Marina. It can be easily reached with a taxi from nearby Aktion airport. If you will land in Corfu International airport you can reach the marina with a bus or with a shuttle transfer that you can book on our website. Lefkas Marina is just next to the old city of Lefkas. On the check-in day we meet the crew, provision the yacht and try to leave the port as soon as possible to reach nearby bay to spend the night anchored in a turquoise-watered bay. Let`s start our Flotilla Sailing Holidays in Greece! Spartochori lies on the Meganissi Island which is intended with several natural harbors and numerous enclosed bays. Most of the bays are forested with olive and cypress trees. Upon our approach to Spartochori we might pass by some villagers fishing out in their traditional wooden boats. The catch of the day is served in the Tavernas on the shore just next to the port. After a short hike we reach the village of Spartochori where people still keep their slow pace of living and enjoy the Greek sun. This evening we spend unwinding, getting into the sailing mode and getting to know everyone from our flotilla. On our way to Atokos island we sail by many bays with beautiful blue water and green olive grows. Slowly making our way down south we approach Formikoula island where we have a lunch stop for swimming and enjoying the view of orange cliffs. The snorkelling set will be very useful here as the marine life is outstanding and in abundance. Upon reaching Atokos island we moor our yachts next to each other to create a yacht raft. This way we spend the night, under psychedelic white cliffs. We are away from civilization, with our yachts creating a private space where we enjoy living. It`s an uninhabited island so this night is ours! It seems to us that the Ionian Sea coast is full of cliffs as we pass the northern tip of Ithaka island on our cruise to Fiskardo. The cliffs (150m) are even higer then on Atokos island (30m). After a quick lunch, and of course a snorkelling session, we continue our sail to the tiny Fiskardo. Prepare for a bit of other yachties as Fiskardo is quite a popular destination for various Flotilla Sailing Holidays in Greece. In this village we resupply our yachts, eat at the waterline Taverna, stroll around the city admiring beautiful blossoms hanging from balconies and rent scooters to explore Kefalonia island. Our main destination of the scooter trip is the Myrtos beach. White warm sand and the bluest water you ever seen is enclosed by a steep slopes (400m). We spend here some time, swim, hike up to admire the sunset and scooter back to Fiskardo. PS. If the weather allows we can also sail further than Fiskardo and anchor at Myrtos beach itself! Sailing further south, along eastern Kefalonia coast we pass numerous beautiful and remote bays. Some are so small that only one yacht fits in, some are a bit larger. Each yacht from our flotilla seeks a different bay to enjoy the peace and tranquility of sailing holidays. It has been only a few days since we sailed out but we already cannot imagine any other way of living. Yachts, friendly people, sun and good food. With this mood we reach Ithaka island, the home of Odysseus. We raft our yachts again near the small, remote island of Ligia. There is a little stone quay on which only the yachts of our flotilla moor. We embark on a journey to count the stars, share food, stories and hopefully do some music and sing the night through. Remember to bring instruments! Vathi is our stopover only for a short time. We arrive, stroll the city, have a quick coffee and an ice cream and leave to sail in Greece further. If your crew prefer you can also choose a lonesome bay to visit or another little village on the coast of Ithaka. Remember that you are always free to talk about your wishes towards the trip with your skipper! 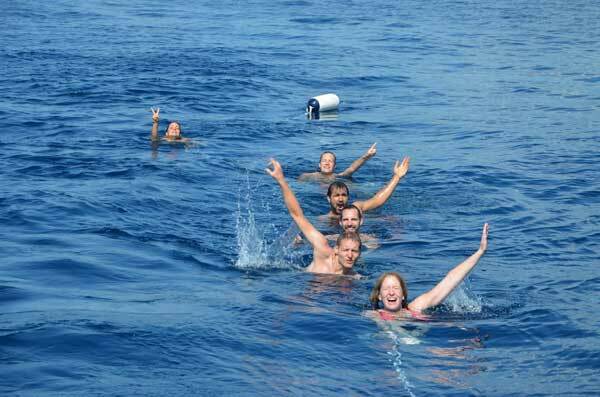 We organize Flotilla Sailing Holidays in Greece like it would be a trip with friends: always flexible and easy! Remember to bring your ABC snorkeling set. 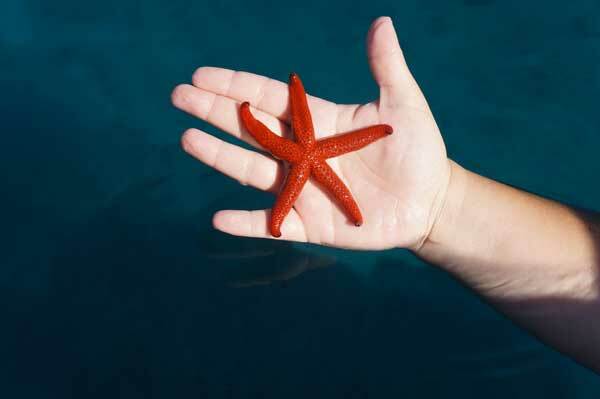 The Ionian coast is full of marine life! There won`t be more than 6 yachts in our Greek flotilla. This allows us to fit into small and uninhabited bays, moor at little restaurants and it makes the group small enough to have a cosy and friendly atmosphere that allows spontaneous ideas to come to life! For example: hiking the nearby hill to admire the sunset, going to a local concert or jamming on our yachts!